Turkish Rules Leave Syrian Refugee Children In Limbo : Parallels Turkey has taken in 2.7 million Syrian refugees since 2011. But it's extremely difficult for refugees to build a new life, particularly for children who often can't get documented. Aref al-Krez, a 24-year-old Syrian refugee living in Gaziantep, Turkey, plays with his daughter Perla, 2, who was born in Turkey. Turkey considers the refugees to be "guests" and it is extremely difficult to obtain the paperwork needed to build new lives. Aref al-Krez has the look of a young, laid-back guy with well-coiffed hair, stylish clothes and carefully cultivated stubble. But the 24-year-old Syrian refugee and father of a young daughter has a world of worries about her future and his role in it. Like so many Syrians now living in Turkey, Krez faces huge bureaucratic hurdles while trying to obtain the right government-issued documents that prove his daughter is actually his. His daughter Perla, age 2, has an uncertain legal status in Turkey, limiting both her rights and future opportunities, like so many of the Syrian children born in Turkey to refugee parents. Turkey has taken in far more Syrian refugees than any other country — 2.7 million refugees since the Syrian war began in 2011, according to the United Nations refugee agency. But Turkey isn't making it easy for them to put down roots and build new lives. For starters, Turkey does not legally consider them "refugees." Rather, the Turkish government calls them "guests." As a result, Syrian children born in Turkey are not given citizenship and face great difficulty in obtaining even basic identity documents. In his small apartment in Gaziantep, the de facto capital of Turkey's Syrian exile community, Krez details the difficulties he's already had in trying to get his family's paperwork in order. "I'm very worried," he says, smiling at Perla, who's doing an impromptu dance. "I don't want her to be stuck in this vague system her whole life. I want her to have the opportunity to reach her dreams." Without a well-defined legal status, be it citizenship or just residency, Perla will be unable to legally leave the country for study or work. 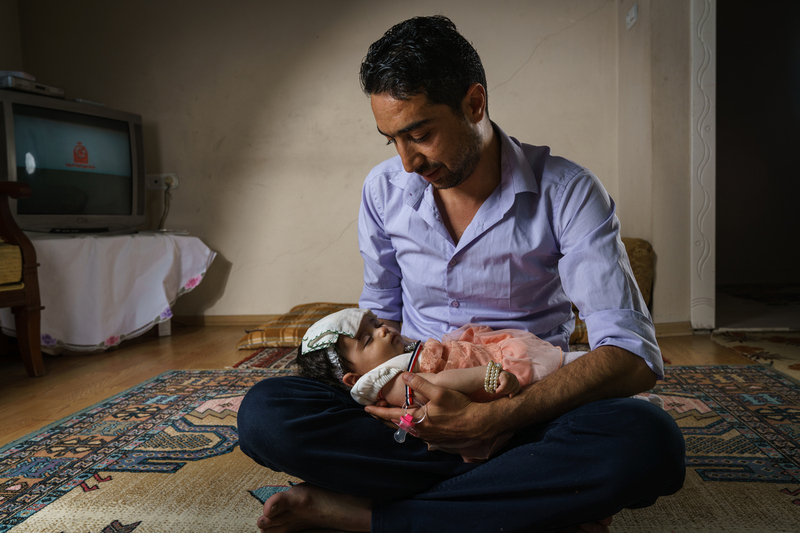 Syrian refugee Taher Hamada, 34, cares for his 4-month-old daughter, Tamara, at his apartment in Gaziantep, Turkey. His lack of documents makes it difficult, if not impossible, for him to travel, and could limit the opportunities for his daughter. In the short term, she lacks papers that define her relationship to her mother and father. In Turkey, many Syrian children who are born in Turkish hospitals are identified as having only one parent, the mother, leaving the children in a legal limbo that limits the family's options for the future. Krez says that because his daughter isn't legally registered as his by the Turkish government, he's afraid to travel too far with her, for fear his family might reach a checkpoint where he can't prove his relation to Perla. Perla's identification difficulties will be compounded later. Under the current law in Turkey, the children of Syrian refugees can't obtain a Turkish passport, making it impossible for them to legally leave and re-enter the country. "Being a Syrian is like being a criminal," Krez laments, adding that those without any identifying documents are even worse off than he. "They are like nobodies. No travel. No work. No respect." It's also exceptionally frustrating. The road to obtaining the proper paperwork begins for many Syria refugees with a seemingly insurmountable Catch-22. First, Syrians need to show Turkish authorities their "Family Book," a passport-shaped booklet that records a family's marriages and births. Syrians who escaped the fighting with their Family Book issued by the Syrian government can often obtain the Turkish equivalent. Another essential document for Syrians in Turkey is the guest registration card known as a "Kimlik," which gives the bearer access to health care and other government services like education. The Kimlik is theoretically available to any Syrian who arrives in Turkey with an accepted form of Syrian ID — even a student ID will do. However, the Kimlik system is extremely slow in providing Syrian refugees with this document, and Turkish officials acknowledge the system is overwhelmed with requests. The dizzying paperwork process is even more difficult for those who were forced to flee Syria without proper identification. They face a brick wall that can only, sometimes, be circumvented with a payment to the right official or finding someone back in Syria to get them a Family Book. Such efforts can cost hundreds or even thousands of dollars, money most Syrian refugees don't have. Taher Hamada is an agricultural engineer by trade facing that very decision. He fled the fighting in Aleppo with his wife, who gave birth four months ago in Turkey to a baby girl named Tamara. Hamada, 34, came to Turkey without a Syrian passport or Family Book, just an ID card, which means he can't obtain a Turkish Family Book, hampering his ability to plan for his family's future. He's considered buying a Syrian passport on the black market, which would cost about $8,000. His high hopes for Tamara — a good education and freedom of movement — seem out of reach unless Hamada can get the documents she needs to solidify her status in Turkey. The right paperwork would also allow him to take a good job he was offered in Saudi Arabia. As it stands, Hamada can't prove his daughter is his, making it impossible for him to travel, since none of them have a valid passport. Yet he remains optimistic, even thankful, considering how much worse things are at home in Syria. "How do people who are worse off than me survive?" says Hamada. "I am lucky." Muhanned Najjar is a researcher for a German newsmagazine who arrived in Turkey with just a local Syrian marriage certificate to prove his union with his wife. Without a Syrian Family Book, there's little hope he'll obtain the Turkish version that legally proves his parentage to his two small children born in Turkey. For now, he has a steady salary, which invites the occasional thought of forgoing the complicated document procurement process, packing up his family and braving the waters off the Turkish coast in hopes of reaching Europe. Many have already made that trip, though thousands have drowned in the last year alone. "At night, I think, 'I will take my family to Europe on the boat,'" says Najjar, chain smoking and shaking his head. But during the light of day, he brushes off the idea, knowing he doesn't want to risk their lives. He also realizes he couldn't go it alone because without the proper papers, his family might never be able to join him. "I don't see how I could possibly be hopeful for the future," he says.